What You Do With That Capital? At a recent policy paper presentation and publication event held at the Korea Economic Institute of America (see the video recording of the conference here) in Washington, D.C., the comments on capital use, profit maximization, and the recent implementation of capital controls prompted me to write this column. Allow me to lay out some of the discussions I had in mind that could not be included in the Q&A session due to the time constraints and the issue of delivering it in a policy forum setting. They may be some sort of a digression from the paper but still very much relevant and important to the subject of capital markets and controls. One of the questions that led me to think was a question from Dr. Stanley Kober (formerly a Research Fellow at the Cato Institute). He started off by mentioning that capital controls may be a timely topic in an era of tremendous U.S. trade deficits, and in macroeconomic theory, it is widely known that current account and capital account balances are closely interlinked. Asian investment in U.S. bonds and accumulation of huge foreign exchange reserves has proved Asia a savings glut. (Some people argue so but I have different thoughts on this.) But his real point was as follows: “The 2nd half of the 1990s in the United States was streamlined with a very efficient American economy coupled with series of investments and a strong dollar. But those trends from the 1990s were discontinued, as we have witnessed in this crisis. So here, the important question is, rather, ‘How do we magnify the effect of capital use (not capital controls)?’ and ‘How do we actually intensify the use of capital?‘, and than ‘Why do we implement capital controls?’ (which was apparently the main scope of my paper)”. He finished his question by saying that “What You Do With That Capital?” is a critical question that must be answered for the future of the nation (in this case he is referring to the the United States and not Korea-which was again, apparently the case of my study). To me it seemed as if Dr. Kober’s comments were rather signs of despair regarding the current U.S. economy and not really catered towards my paper per se. But at the same time, his question was intriguing enough to make me want go back to the economic literature on magnifying the effects of capital investment and come up with some policy suggestions in the latter part of the paper (if that makes him feel any better, although I am still wondering how I will incorporate the U.S. part of the story in a Korea-focused paper in the end.) The previous literature in economics on maximization of profits from capital investment in a competitive and contestable market proves that a firm can only make profit in the short run, and that economic profit is guaranteed in a monopoly. Profit maximization itself in economics also assumes a short-run process in which firms determine the price levels and output for the greatest profit. But let’s take a step back and take a macro-view on the U.S. downturn; even after the Lehman collapse, the U.S. economy is still going on strong, though it may take time to (or it may never) recover to the status of what it used to be. But the assumption that the heyday of U.S. economic prosperity would continue forever is a big mistake, and there is no reason why another nation like China cannot be prosperous and rich. (Here, I do not mean that I favor China’s way of seeking to transform global economic or political order.) Going back to the prime of U.S. economy in the 1990s, are we forgetting the 1994 Peso Crisis in Mexico? (For further understanding of what I am intending to say, check out the PBS Frontline Documentary ‘The Crash’.) The spiral of U.S. prosperity that has been enjoyed on the backs of smaller developing countries cannot continue. Although I found Dr. Kober’s question a bit of a digression from my main points of the paper, I did give him the alternative viewpoint by explaining to him what Korea (and some other countries that suffered from the Asian Financial Crisis) went through during the 1990s when the U.S. had its economy up and going during the same period. I explained to him how concerns regarding ownership shares (of firms, enterprises like Samsung) in Korea have become a sensitive issue since Korea’s deregulation of the financial sector (which of course occurred under foreign pressures), how East Asian countries ultimately chose to build huge foreign exchange reserves for emergency use, and how exchange rate policies were maintained in accordance to the global market changes (especially in the case of Korea, although the government currently denies any currency intervention on a regular basis). 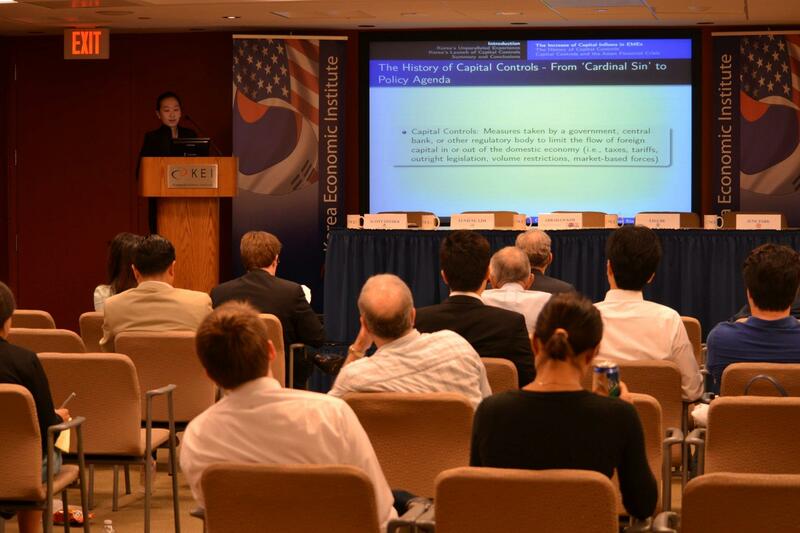 I alluded to the fact that this time the choices made for capital controls are under a global consensus and that Korea’s capital controls were inevitable to avoid the same experience of the Asian Financial Crisis. For a country like Korea, or Malaysia, Indonesia, or any other Emerging Market Economy (EME) which has had the history of hitting the bottom due to a financial crisis, this is a matter of survival.